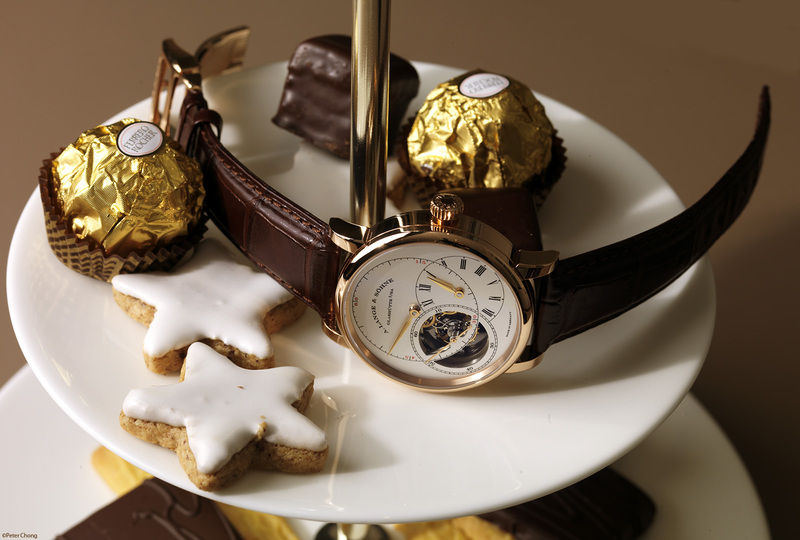 The early release for the A. Lange & Sohne novelty for 2011...embargo lifted at 9am GMT 20th December 2010. As may have been leaked out by other press, I have chosen to respect the embargo placed on this release. This new Pour le Merite, as with all of the family to be known as Pour le Merite (a German civil and scientific medal awarded to receipients who have demonstrated significant achievments in their field...not to be confused with a medal of the same name, but with military intentions for bravery in war), this new watch features the fusee in chain. 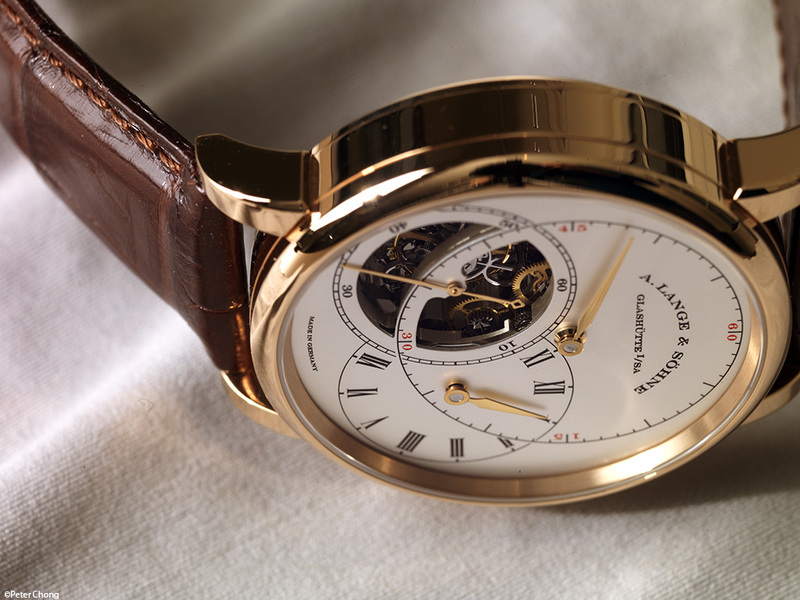 This is now the fourth watch within the series - the first being simply named the Pour le Merite Tourbillon, the second the Pour le Merite Tourbograph, the third the Richard Lange Pour le Merite and this one. 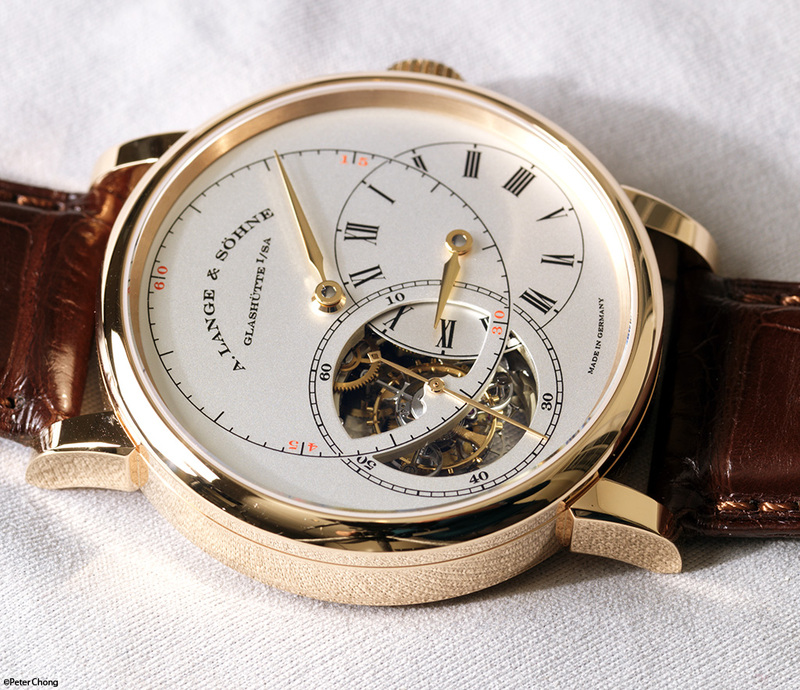 A very large minute hand adorns the central position, with an overlapping hour hand at 4, and the seconds hand, mounted on the axe of the one minute tourbillon is at 8. 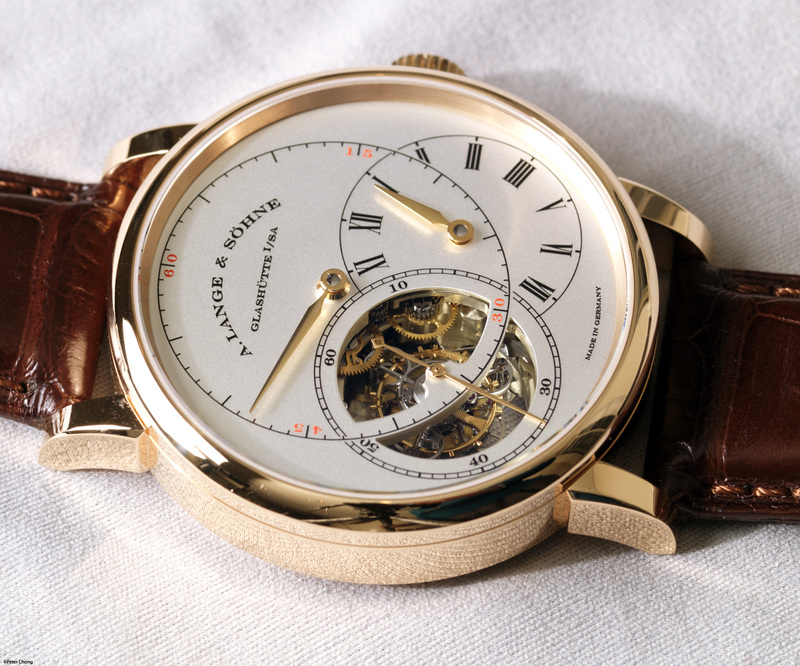 The seconds subdial is open to show the beautiful tourbillon. 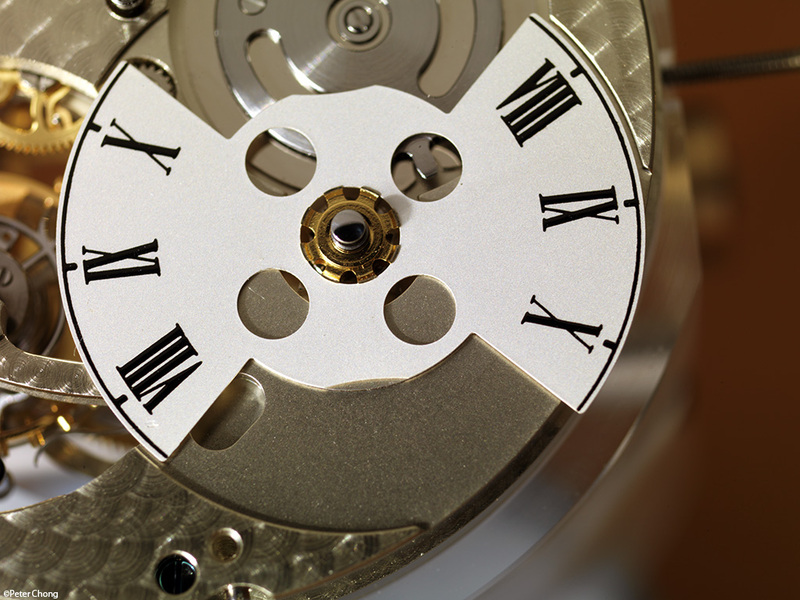 Because of the overlapping dials, at certain positions when the hour hand is overlapping the open seconds sub-dial, the time is not easily read. 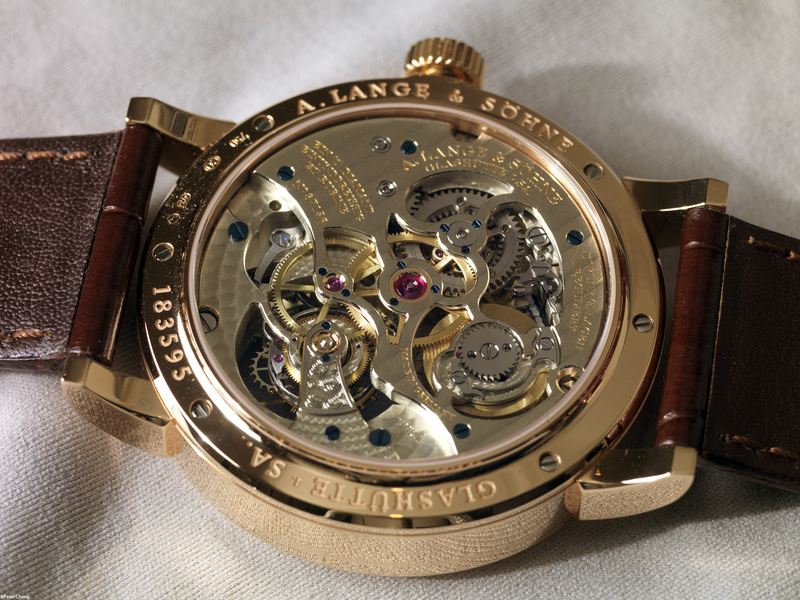 To solve this problem, Lange created a jumping subdial, which springs into place when the hour hand reaches 6 o'clock, and closes a portion of the tourbillon opening, providing markings for the hours to be read. And at 12 o'clock, it flicks away to allow the owner to gaze on the entire tourbillon. Note the almost instantaneous flicking of the subdial as I turn the hour hand, occuring precisely when the hour hand reaches 6 o'clock to close the subdial, and again when it reaches 12 o'clock. 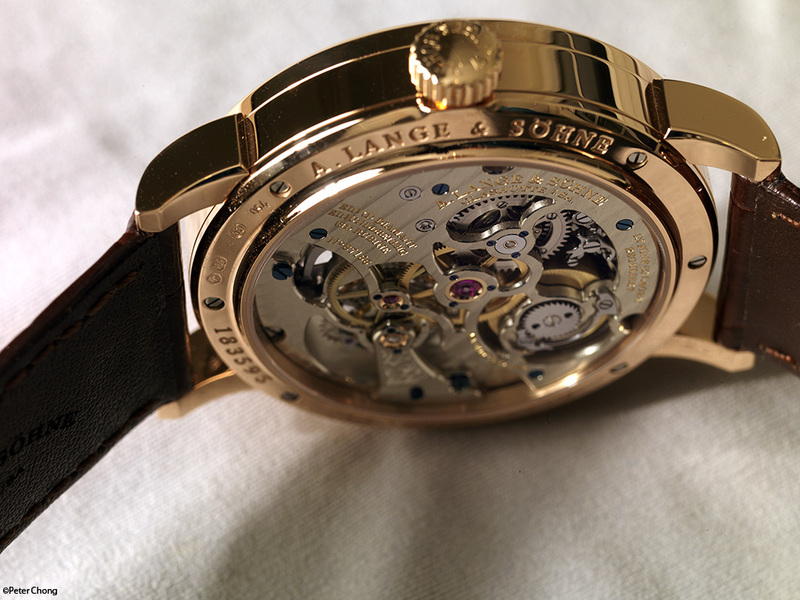 The watch also features the now already famous Lange tourbillon, the cage design which is taken from the old Lange tourbillon designs...as documented in the Meis book "Das Tourbillon" as Lange 2. This tourbillon cage was adopted in the early years by Gunter Blumlein and has remained in use ever since for all Lange tourbillon watches. 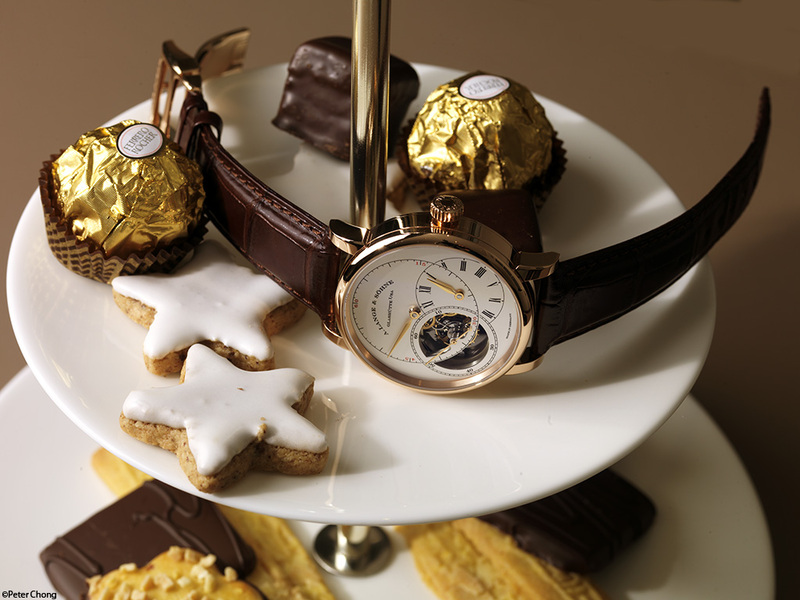 As with the tourbillon in the Cabaret Tourbillon and the Homage Honey Gold Lange 1 Tourbillon, the tourbillon is equipped with a hack mechanism, now unique and exclusive to Lange. Note at about 10 o'clock, the snail cam mechanism. 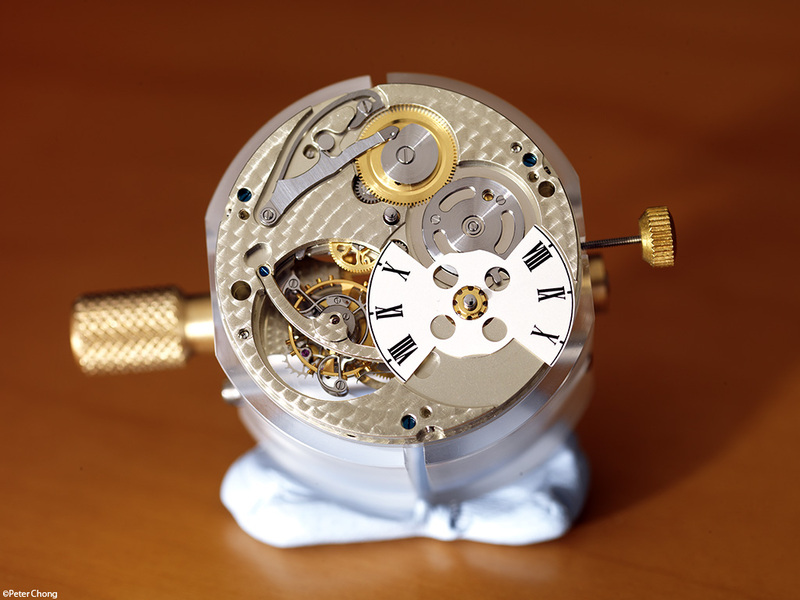 The flat spring rides the cam which makes one revolution once every 6 hours, and snaps down the sharp ridge at the edge of the cam causing the dial to instantly flick across, to close or open the sub-dial. All edges are finished with beautiful anglage, and polished. And the movement catches light in a very beautiful way...glistening, shining, tempting the viewer to take a closer look. 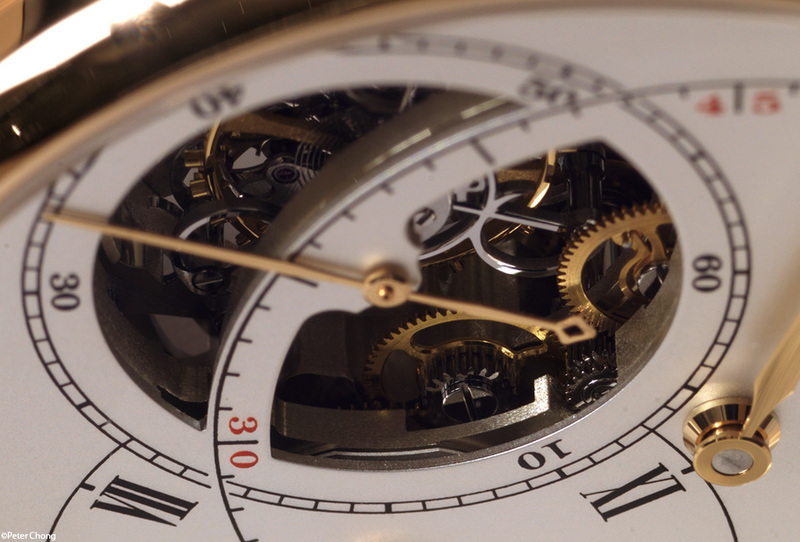 The movement is complex and beautifully laid out, and as one looks closer, there is more and yet more to discover in the complication and the finish. Note the double spring engaging onto the wolf's teeth of the click on top of the mainspring barrel, seen at about 3 in the picture above. And the finish on the fusee blocking mechanism which stips the fusee from unwinding by lifting the block mechanism at approximately 36 hours of run-time. 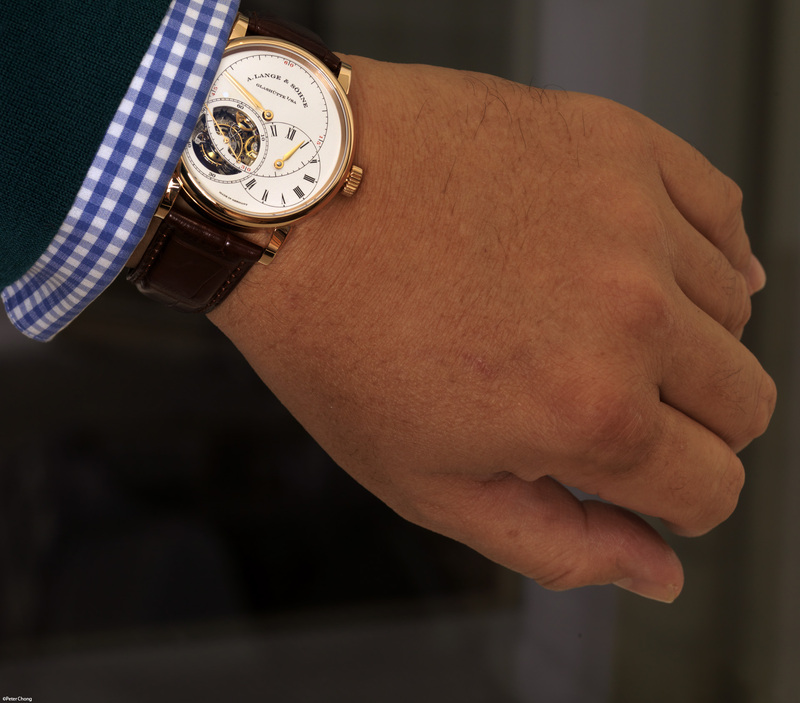 A wrist shot...diameter of the watch is 41.9mm, with a case height of 12.2mm ...quite wearable. Shown on my 8.5" wrist. The movement itself measures 33.6mm in diameter and a height of 7.6mm.